Over at The Classroom, there is a Flower Parade going on. 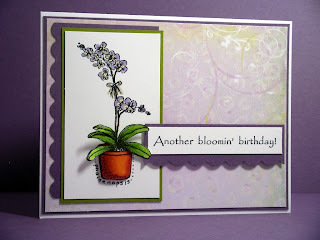 Since I love flowers, and I needed a birthday card, and I needed to get this new Karen Lockhart stamp inky, I decided to join in. LOVE this stamp! I think orchids are just soooooo beautiful! I colored it with my copics and to add a bit of dimension, colored a second imprint of just the pot and leaves, cut them out and popped them up. I rounded the pot a bit from side to side and layered rolled up glue dots vertically under the center of the pot. The sentiment is from Make An Impression. 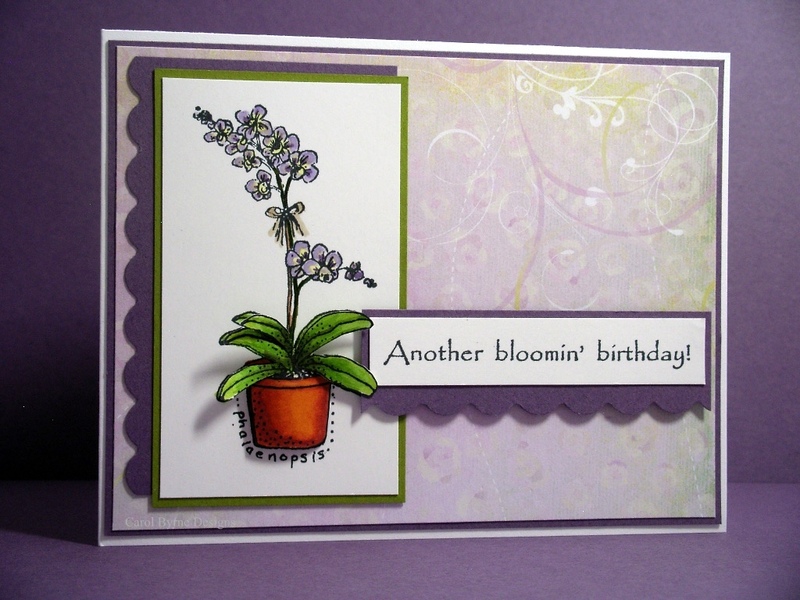 Patterned paper is from Memory Box; cardstock is Gina K, Classic Crest and SU. Scallops are from a Fiskars border punch. Take a look at all the other pretty cards in the Flower Parade through the link above to The Classroom and leave a little love. Beautiful card!! Love your coloring very much! Thanks so much for stopping by my blog and leave me some kind comments. GORGEOUS!!! WOW = this is just beautiful! I love Lockhart stamps!! You did her proud with this creation! The added dimension makes your image extra special. Nicely done. Thanks. So lovely! I love how you popped the flowerpot and your copic coloring is great. I can't get the hang of coloring with copics and am always in awe of people who can. This is really lovely Carol. I love how you gave it 3D dimension. That's always fun. Love the colors and that DP is beautiful. Thanks so much for visiting my blog and leaving a comment! This is delightful! Great job with the coloring! Hi carol! love the coloring on that flower.. and the sentiment is very pretty! Carol you have made that flower come to life. Your coloring is perfection. Beautiful!! I second Rainy's comment -- you totally brought this flower to life! Absolutely GORGEOUS! Thank you so much for joining in our flower parade and sharing this beauty with others! So pretty! Love the popped up leaves - it adds so much dimension! Another winner! !